Mike O’Laughlin of Kansas City’s Irish Roots Cafe let me know that he has now posted the first weekly episode of Missouri Irish for your FREE listening pleasure. 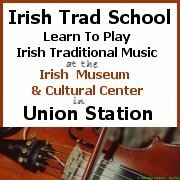 Missouri Irish is a weekly podcast on the history of the Irish in America. The first 10 episodes are focusing on Kansas City in both Missouri and Kansas, because the Irish Roots Cafe was founded in KC - all the way back in 1978. In those first KC episodes you’ll hear commentary from William Worley, Michael Burke, Pat O’Neill, Kerry Browne, Peter Adams, Peggy Sheehan, Pete Maher, Rachel Casey and others. The earliest days of Kansas City in the early 1800’s to the Pendergast era will be covered, and then so will the modern day festivals and parades. Irish roots already offers a ton of great resources including podcasts on Irish Genealogy, and this new series is a wonderful addition to the oral folklore of Irish-America. The series covers the story of the Irish in America including interviews with historians, business owners, every day Irish, and politicians. The second city that will be covered is St. Louis, Missouri. The Irish Roots Cafe since 1978 has been a publisher of rare Irish books, and is currently also the home of Irish podcasts, newsletters and a blog. This entry was posted on Monday, June 4th, 2007 at 10:40 am and is filed under Books, History, Immigration, blogs. You can follow responses via my RSS 2.0 feed. Both comments and pings are currently closed.